The increasing complexity of medical devices has compelled device manufacturers to convey important information to consumers. This has been a major factor fueling the demand for medical device labels. Manufacturers use medical device labeling to provide general description of the medical device and other additional information. Rising number of new medical devices and drug discoveries are some of the prominent factors which lead to increasing demand of the global medical device labeling market. FDA standards for patient safety is one of the prime factors that is driving the medical device labeling market. With significant growth in the healthcare and pharmaceutical industry, medical device labeling market is expected to witness exponential growth. Established players have expanded their production capabilities as well as their geographical reach to consolidate their position. Increasing globalization and cross border trade is one of the key factors which are expected to play a critical role in the growth of the global medical device labeling market. Medical device labels with multi language instructions helps manufacturers to trace their product for documentation and efficient distribution. Global supply chains for pharmaceuticals are getting elongated. Also, with stringent regulations regarding standards for patient safety by the FDA, more and more medical device manufacturers are focused on compliant labeling procedures, which is also anticipated to help in boosting sales of medical device labels, during the forecast period. According to the U.S. Food and Drug Administration (FDA), the labels of medical devices are now required to include a UDI through distribution and use, except where the rule provides for an exception or alternative placement. A UDI is a unique numeric or alphanumeric code that consists of two parts: a device identifier (DI) and a production identifier (PI). On the basis of label type, medical device labeling market is segmented into pressure sensitive labels, glue applied labels, sleeve labels, in mold labels, and others. Pressure sensitive labels segment accounts for the largest market share of medical device labeling market of because of growth in the technological advancements to overcome the existing challenges. On the basis of material type, medical device labeling market is segmented into paper, plastic and other segment. Paper segment dominates the market of global medical device labeling market. On the basis of application, the medical device labeling market is segmented into disposable consumables, monitoring & diagnostic equipment, and therapeutic equipment. Disposable consumables segment is however expected to dominate the market during the forecast period. The North America region is estimated to account for the largest share in medical device labeling market due to high investment on research and development in the medical sector in this region. North America is expected to trail the APAC region in medical device labeling market. The MEA region is estimated to contribute small but rapidly growing market share. 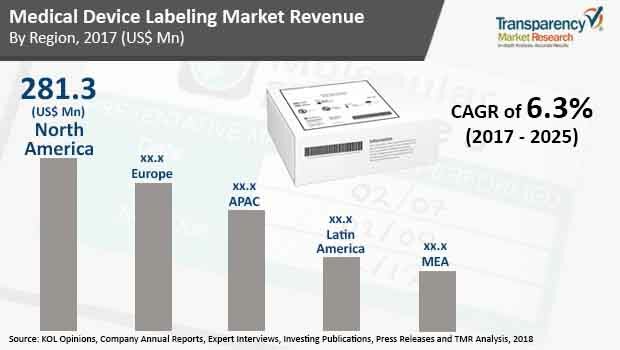 Growth in medical device labeling market in Latin America region is expected to be moderate during the forecast period. A few of the key players in the global medical device labeling market include 3M Company, Amcor Limited, Mondi Group Plc, Avery Dennison Corporation, Lintec Corporation, Huhtamaki Oyj, UPM Raflatac, CCL Industries Inc, Schreiner Group GmbH & Co. KG, Denny Bros Ltd., WS Packaging Group, Inc, Resource Label Group LLC, Faubel & Co.Nachf. GmbH, Tapecon Inc., Weber Packaging Solutions, Inc., JH Bertrand Inc., Coast Label Company, and Label Source. Transparency Market Research examines the global medical device labeling market during the forecast period 2017-2025. The primary objective of the report is to identify opportunities in the market and present updates as well as insights about various segments of the global medical device labeling market. The report begins with an overview of the global medical device labeling market, evaluating market performance regarding revenue, followed by TMR’s analysis of key trends, drivers and restraints witnessed in the global retail as well as medical device labeling market. Weighted average pricing analysis of medical device labeling market is based on label type is also included in the report. To compute the market size, in-depth secondary research is done. Data points such as regional splits and market split by label type, material and application have been assimilated to arrive at the market estimates. The report comprises the forecast of the global revenue generated by sales of medical device label across the retail industry. Market numbers have been estimated based on extensive secondary and primary research, average pricing of medical device labeling market by label type and the revenue is derived through regional pricing trends. Market size and forecast for each segment have been provided in the context of global and regional markets. The medical device labeling market has been analyzed based on expected demand. Prices considered for the calculation of revenue are average regional prices obtained through primary quotes from numerous regional medical device labels manufacturers, suppliers, and distributors. All key end users have been considered and potential applications have been estimated on the basis of secondary sources and feedback from primary respondents. Country demand patterns have been considered while estimating the market for various end users of medical device labels in the different regions. Bottom-up approach has been used to estimate the medical device labeling market by regions. Global market numbers by label type, by material type, and by application have been derived using the bottom-up approach, which is cumulative of each country’s demand. The same has also been validated from top-down approach. Company-level market share has been derived on the basis of revenues reported by key manufacturers. The market has been forecast based on constant currency rates. TMR triangulates the data via a different analysis based on the supply side, demand side, as well as dynamics of medical device labeling market. TMR not only conducts forecasts in terms of value but also evaluates the market on the basis of essential parameters, such as Year-on-Year (Y-o-Y) growth. This helps providers to recognize the future opportunities as well predictability of the market. In order to understand and assess opportunities in this market, the report is categorically divided into four key sections on the basis of label type, material type, application and region. The report analyzes the global medical device labeling market in terms of value (US$ Mn) and volume (‘000 sqm). A vital feature of this report is the analysis of the global medical device labeling market by region, label type, material type and application; and the corresponding revenue forecast in terms of absolute dollar opportunity. This is traditionally overlooked while forecasting the market. However, absolute dollar opportunity is critical in assessing the level of opportunity that a provider can look to achieve as well as to provide potential resources from sales perspective of the global medical device labeling market. To understand key segments in terms of their growth and performance in the medical device labeling market, Transparency Market Research has developed a market attractiveness index. The resulting index should help providers identify existing market opportunities in the global medical device labeling market. In the final section of the report, medical device labeling market competitive landscape has been included to provide a dashboard view of companies that manufactures and provides medical device label. The report contains company profiles of some of the players in the medical device labeling market. Few of the key players in the global medical device labeling market include 3M Company, Amcor Limited, Mondi Group Plc, Avery Dennison Corporation, Lintec Corporation, Huhtamaki Oyj, UPM Raflatac, CCL Industries Inc, Schreiner Group GmbH & Co. KG, Denny Bros Ltd., WS Packaging Group, Inc, Resource Label Group LLC, Faubel & Co.Nachf. GmbH, Tapecon Inc., Weber Packaging Solutions, Inc., JH Bertrand Inc., Coast Label Company, and Label Source.